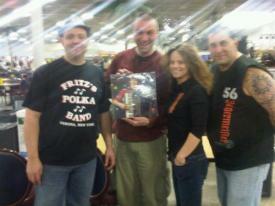 Fritz's Polka Band is shown here with Carolyn Mosher of the Hard Rock Cafe during FPB's evening gig at the Hard Rock Cafe Dyngus Day Bash on April 25, 2011. Frank, Fritz, and Mike are pictured tearing through a tune during FPB's gig at the Hard Rock Cafe Dyngus Day Bash on April 25th in Niagara Falls, NY. Fritz's Polka Band cranks it up at the Hard Rock Cafe Dyngus Day Bash in Niagara Falls, NY during the evening of April 25, 2011. Fritz's Polka Band is shown here inside the Hard Rock Cafe in Niagara Falls, NY on April 25th prior to taking the stage for the Hard Rock Cafe Dyngus Day Bash. FPB member, Frank Nelson dances with a volunteer from the audience to dance a tune as FPB plays in the background on April 25th in Buffalo, NY. 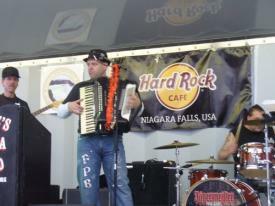 Tom and Frank are pictured here in Buffalo, NY at Broadway Market on April 25th during FPB's first gig of the day. Fritz is pictured here with FPB Fan Club Members, Ralph & Helen Kommer on April 25th in Buffalo, NY during FPB's first gig of the day. 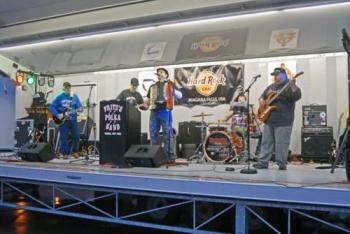 Fritz is shown here during FPB's gig on April 17, 2011 in Lee Center, NY. Mike is pictured here during FPB's gig on April 17th in Lee Center, NY. 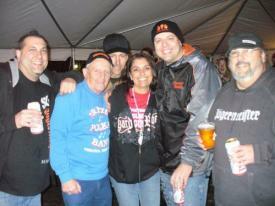 Tom, Fritz, Mike, Frank, and Gabe are shown here during a break in the April 2nd gig in Syracuse, NY at Paradise Market. 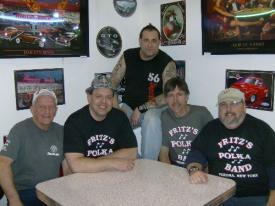 Mike and Fritz are shown here with three generations of the Laskevicz family on April 2, 2011 in Syracuse, NY. 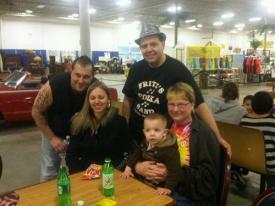 Fritz and Mike are pictured here with Matt and Brenda Episcopo during a break at FPB's April 2nd gig in Syracuse, NY. Be sure to look closely at the FPB record (yes, record, as in vinyl!) that Matt's holding. Frank and Fritz are shown here during FPB's gig on April 2nd in Syracuse, NY. Mike is pictured here during FPB's gig at Paradise Market on April 2, 2011 in Syracuse, NY. Gabe jams on his six string during FPB's gig on April 2nd in Syracuse, NY.